Eight year old Odin insisted that he wanted to help children and animals in a West African country that suffered due to the lack of water. Cornerspring Montessori teacher Cindy Scappaticci had no clue where he got this idea, but following his lead she searched the internet. She discovered Amman Imman. The story of the people of the Azawak deeply moved Odin, but being shy he did not know how to express his deep feelings. When Odin watched the video, Water Crisis in the Azawak, he had to turn away, "Because it was too sad", he said. His mother encouraged him to share his sensitivity with his classmates. "Your sadness will help you understand your passion," she said. 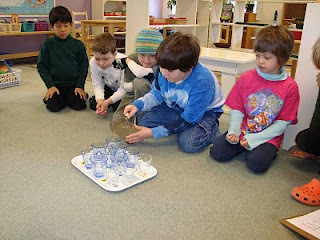 Odin made a presentation, bringing a tray with 18 clear glasses to his circle of classmates. Everyone drank a glass of water. Next, Odin shared the struggles that the people of the Azawak endure by reading aloud the book Amman Imman - A Story . The story of these beautiful people, living without the dignity of having water to drink, unfolded to the children through the simple and compelling words and photographs. Then, Odin filled the glasses again, but this time with muddy brackish water. The children understood. No one wanted to drink that water. Teacher Cindy finds the term "Heroes of Compassion" very appropriate, "That's who these children are in their make up," she says. By designating kids as Heroes of Compassion, their caring nature is validated. For Odin, Amman Imman has been a vehicle for his own passion, and a way for him to feel and express his compassion. When Odin asked his friends if they wanted to join him in helping bring water to the Azawak, each child signed their name to his poster that declared: Yes, we will help you with your water project. At Odin's insistence, the class held a bake sale. Parents and children together baked cupcakes. The bake sale was a huge success, bringing out the generosity of the small Cornerspring community in supporting their children's desire to help the children of the Azawak with their water problems. Odin watched in amazement as all the baked goods arrived and were sold. When told how much money was made, he exclaimed. "You mean we get to send $170 to Africa? I can't believe it!" 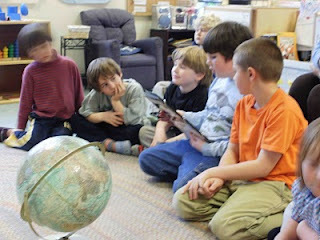 Teacher Cindy reports, "There is much meaningful and generous work happening in our school. Children of all ages working together and soliciting help from families! The sense of supporting others can be felt through all of it. It's very contagious: a friend of my husband's, who owns a record store in a nearby city wants to know how he can help - he is so impressed with the compassion and motivation being displayed. He has offered to make a donation or to put a container on his counter so his customers can make donations. How clear it truly is, that the children can lead us to discovering (or remembering) our true selves!" Thank you for your compassion, Odin! You helped make the world a better place.